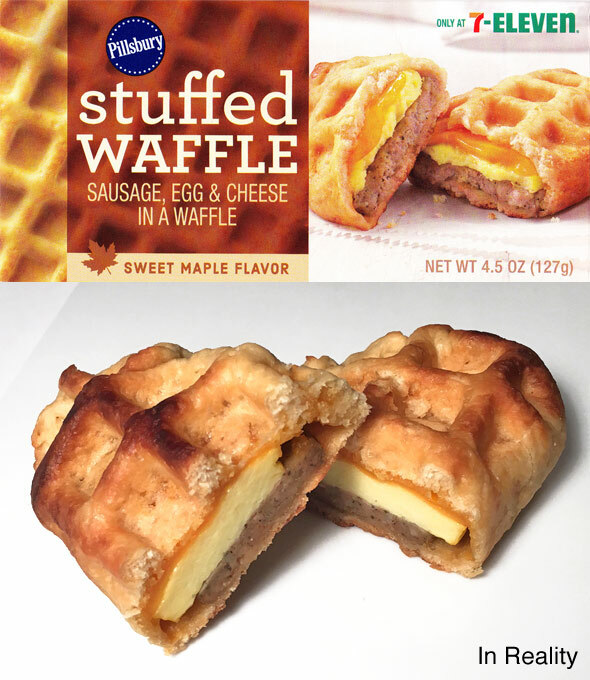 This product is described on the package as "sausage, egg & cheese in a waffle (with) sweet maple flavor." It's made by Pillsbury and is currently only available at 7-Eleven Stores. You find them in the warm foods section of store (usually near the counter) where the hot dogs are. When you open the package, you're hit right away with enticing smells of breakfast, particularly maple and sausage. My Stuffed Waffle wasn't quite as attractive as the one shown on the package. Parts of the waffle casing were a little scorched. However... when I cut the Stuffed Waffle in half, I was impressed by how much it looked like the product in the pictures. The sausage, egg and cheese were plentiful and each had their own layer like that of a fast food breakfast sandwich. We were off to a good start. It smelled pretty good and looked pretty good. 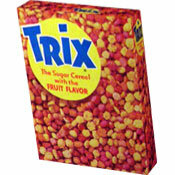 In the first 2 or 3 bites, you might notice a slight artificial flavor stemming from, I believe, the maple. But that goes away the more you eat. The sausage tasted great. The best bites are the ones where the cheese is most noticeable. The egg was fine and I appreciated that it wasn't soggy or mushy like you might find in store-bought breakfast burritos. The biggest surprise comes from the "waffle" component of this product. It looks like a waffle, but it tastes and feels more like a tender biscuit crossed with a baked pie crust. That's not necessarily a bad thing. It's just not what I expected. Overall, I found this product to be satisfying, filling and fun to try. When compared to other breakfast offerings from 7-Eleven, this ranks quite high. 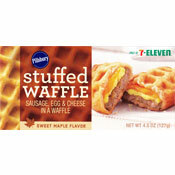 The last 7-Eleven product I reviewed was their Breakfast Empanada Bites. That was a mishmash of crumbled breakfast foods in a pastry crust. It wasn't great. The Stuffed Waffle is a step forward. 7-Eleven has yet to produce anything as good as you'd get from a fast food drive-thru, but this makes you think that one day they might. Bottom Line: If you're getting breakfast from 7-Eleven, definitely give this a try. If you have the ability to go anywhere else for anything else, that might be a better bet. Nutritional Considerations: Each Stuffed Waffle has 520 calories, 34 grams total fat (15 grams saturated and 0 grams trans), 140mg cholesterol, 800mg sodium, 38 grams total carbs, 1 gram dietary fiber, 11 grams sugar and 15 grams protein. 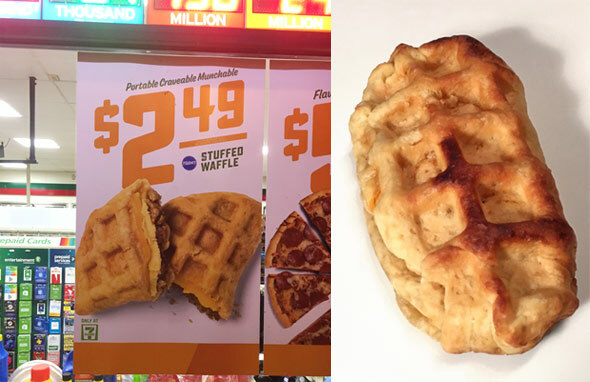 What do you think of Stuffed Waffle? 3rd day in a row of having this for breakfast. VERY tasty - the maple compliments the sausage really well. It's good for something from 7-11. I'll probably have it again. I wish it had more cheese. Would like to try it, but my 7-11 never has them... even though they have a big sign on the window. Do they stop serving them after 10 or something?